The Legislature has begun consideration of a package of six bills introduced on July 1 to amend the electric choice program. Unfortunately, the proposed legislation, while more modest than the reforms advocated by CLEAR, is flawed. The package includes legislation that would require all electricity suppliers to maintain a “reserve” generating capacity of 15 percent. This proposal appears to be an attempt to “level the playing field” for the incumbent utilities by imposing on all suppliers the reserve requirements currently applied only to the former monopolies. The proposed 15-percent reserve requirement is wholly arbitrary, however, and would significantly increase the cost of market entry for competitors — thereby thwarting the purpose of restructuring. A more rational approach would be to eliminate government reserve requirements altogether. Power generators have every incentive to maintain adequate electricity supplies for their customers — especially in a competitive market. Another element of the proposed legislation would require all power suppliers to contribute to a subsidy fund for low-income customers. But such a requirement would effectively constitute a new tax, in addition to the substantial subsidy programs that currently exist. If lawmakers deem energy assistance to be a worthy social goal, payments should be allocated from the General Fund rather than borne by utilities and ratepayers. Also proposed is a new method of calculating the amount consumers are forced to pay for the supposed “stranded costs” of incumbent utilities. The proposed calculation would eliminate the annual accounting of cost savings realized by the incumbents through improved efficiencies. This proposal is misguided because consumers would pay higher “stranded costs,” while the incumbent utilities would have less incentive to operate more efficiently. A related proposal to extend to 10 years the period in which transition charges are levied on all ratepayers should also be rejected as unnecessarily costly and anti-competitive. The legislation also contains a provision to create a new energy subsidy, ranging between 10 percent and 20 percent, for K-12 public schools. But as noted earlier, schools have already realized energy savings by contracting with alternative electricity suppliers. The cost of a new subsidy would be borne by all ratepayers, but there is no justification to impose a new school energy tax on Michigan citizens. A proposal to provide low-interest financing to the incumbent utilities for plant improvements is also unwarranted. Every new charge levied on ratepayers reduces the cost-savings that can be realized through competition. This proposed subsidy thus undermines the viability of competing suppliers by artificially increasing their rates. One proposal does merit serious consideration. It would eliminate the current requirement that incumbent utilities must reconnect customers who discontinue service with an alternative supplier at the regulated rate. This change would reduce the burden on incumbent utilities of maintaining unused capacity, or of having to buy more costly power on the spot market. The goal of a competitive market will not be fulfilled until the vestiges of monopoly regulation are eliminated. 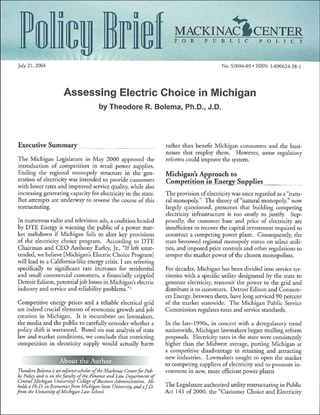 As with any product or service, electricity customers must weigh the benefits and risks of their choices. If they are dissatisfied for any reason with their power supplier, they remain free to shop for another. This consumer freedom is precisely the disciplinary force that will keep power suppliers in line.